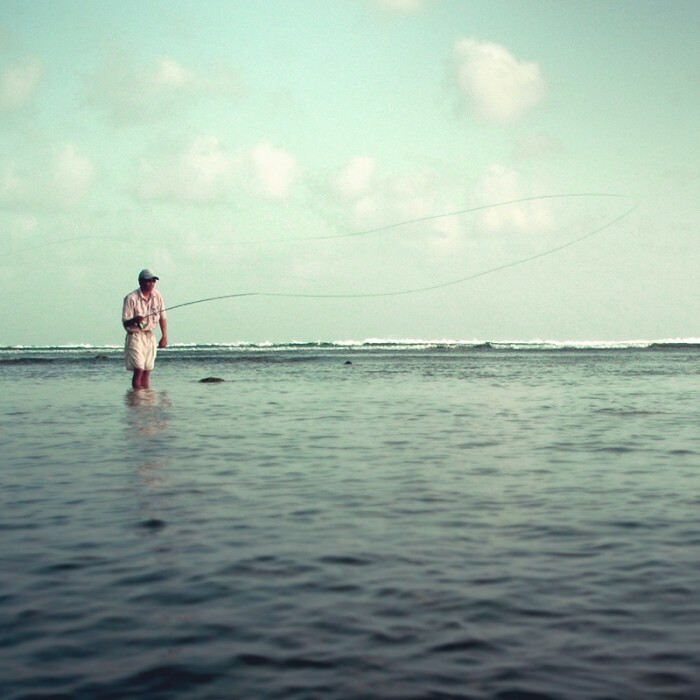 Fly Fishing for Bonefish is what we do… sure, there are many other types of fishing on Grand Cayman—tarpon, jacks, snapper, cudas, palometa, snook and even permit—but bonefishing is sort of our thing. 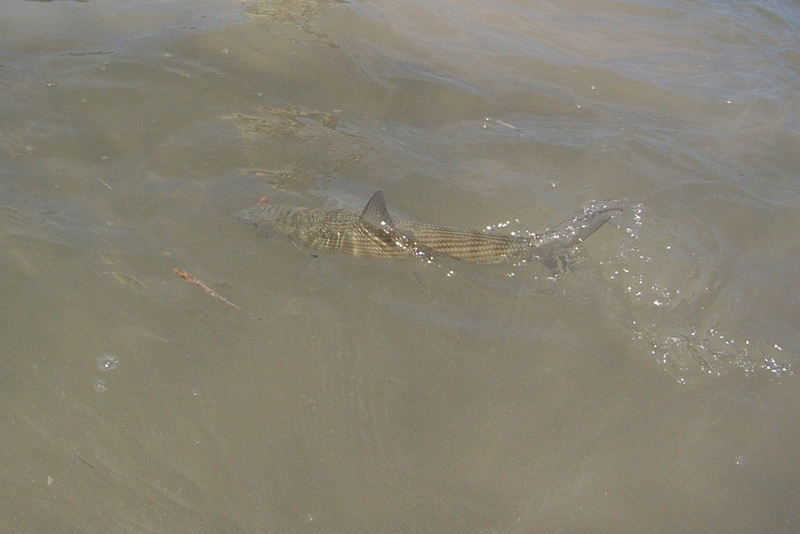 Bonefish are fairly predictable, accessible and (thankfully) seem to think mostly with their stomachs. Despite what you might have heard or read, catching a bonefish on fly your first time out is realistic—sure it’s challenging, but doable. Yeah, we’d all like to catch a 100-pound tarpon on fly or land a tailing permit while wading, but that’s elite level stuff; it might not be the best place to start in saltwater. Bonefishing, on the other hand, is a great way to get a taste of saltwater fly fishing and get a few fish on the line. The easiest thing to make your trip successful is to practice your casting. Of course, there is a lot to learn. Elements like tides, bonefish behavior, fly placement, wind conditions, fly-weight, and water depth all play a part, but we’re happy to share some of our hard-earned knowledge with you. Below are a few bonefishing tips and techniques that will help you understand what the heck your guide is talking about and help make bonefishing a lot more manageable. But, before you follow any of these suggestions, make sure you’ve got the right gear. Looking for Bonefish Tails at Dusk. 1) Wakes or nervous water are made by feeding or traveling bonefish. Singles or small groups create pronounced V-wakes as they cross shallow water while schools disturb a larger area of the surface. A quick shot ahead of the wake can often produce. Remember, the tail of the fish causes the wake, so you should cast at least 5 feet ahead to make sure you don’t line the fish. The only trouble with fishing to wakes or nervous water is not knowing for certain you are casting to bonefish. Wakes can be caused by any number of fish that also frequent shallow water. Happily, many of these are also great fun on fly tackle so casting at any wakes is a good idea. 2) Seeing the fish through the water. This is by far easiest over light colored, sandy bottom where the dark shapes of bonefish can be seen from quite a distance. When they are facing directly toward or away from you their dark backs are very distinct almost a “coke-bottle” green. If you see a fish then suddenly lose it, this often means it has turned its side to you. Scan to the left and right of where you saw it and you’ll usually pick it up again. Bonefish are highly reflective and mirror their environment with near perfection. If a fish turns sideways to you often the only sign is its shadow. As you search a flat, scan for any movement out of the ordinary. Under a noontime sun often the only thing you can see is their shadows ghosting over the flat. 4) Bonefish “puffs” or muds are easy to see over softer bottoms. Puffs are little patches of cloudy water that mark where a fish has used its nose to root out prey buried in the bottom. Usually seen over grassy bottom and appearing in a series, puffs can mark the direction bonefish are feeding. Cast ahead of the freshest puff, let the fly sink to fish level, and begin a slow, steady retrieve, pausing occasionally. Bones will often hit on those pauses. So, got the fish in our sights. What now? First, you have to get the fish to see the fly. This means accurately predicting where the fish is going to be, if it’s moving, and getting your fly there (see below for casting tips). Remember, during the presentation cast don’t look at the fish. Instead focus on the exact spot you want your fly to land. Typically this is 3-10 feet in front of the fish, or on the “eye-side” if it’s moving at right angles to your cast. Never cast behind the fish, as this will usually trigger a “flee” reflex. Only predators approach from behind. If you do cast beyond (and behind) the fish, don’t strip the fly or it will appear to be “attacking” the fish. 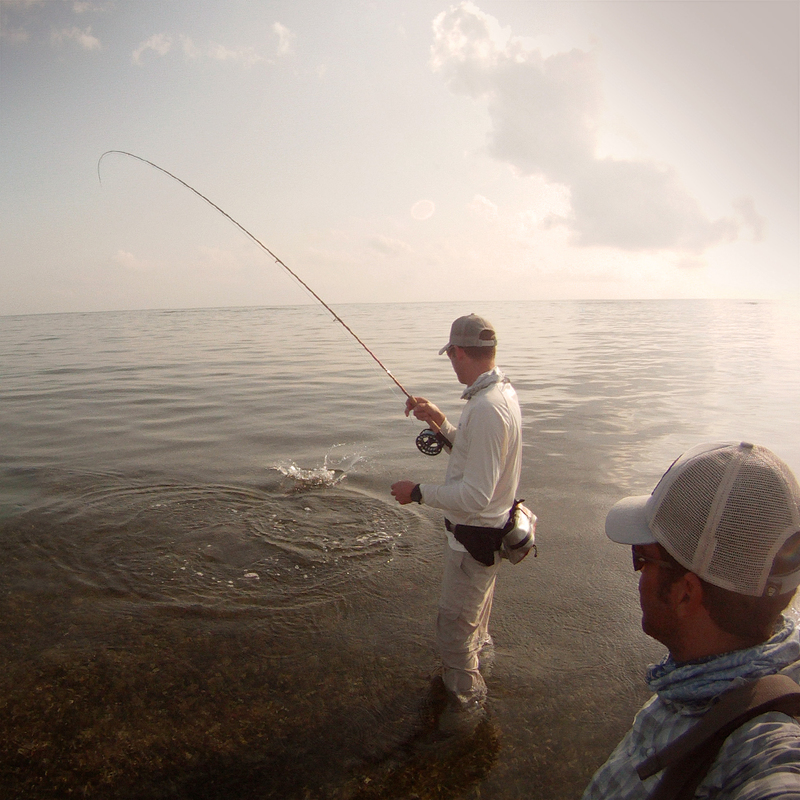 If you simply let the fly sink, a bonefish will often turn and grab it on the drop. Focus on the exact spot you want your fly to land. Bonefish mainly forage on the bottom and although they will take a fly quite close to the surface are more apt to pick a fly up than chase one down. Practically speaking this means one should move the fly less, not more. These are not bonita or jacks, and fast 2-foot strips won’t (usually) get it done. I find it is generally best to begin with a sloooowww strip and if the fish follows let the fly drop for the pickup. Once the fish sees the fly and follows it, let him catch it. This may only mean pausing in your retrieve or actually letting it sink to the bottom altogether. Once the fish stops near your fly immediately make a long strip. You should come tight. If you pause and the fish darts forward, it’s got the fly. Now, DO NOT RAISE THE ROD yet. Simply make a long, smooth strip until you feel the weight of the fish. This is the most delicate part of the operation for it is easy to snap 12-pound tippet by holding on too tight or slamming the fly home. Once the line is tight you can finally raise the rod. Remember, don’t strike bonefish the way you do trout. Raising the rod is only to cushion the tippet from that first run and keep the line off the bottom where it might catch on coral or mangrove shoots. Bonefish have soft mouths that hold a hook well. Merely coming tight usually sets the hook and their first run (at around 25mph) drives it in even further. And remember, rely on your guide’s advice. They do this day in, day out and will usually know from the fish’s reaction the best way to get the bite. Once you’ve hooked the fish the first thing is to get them on the reel. Never try to hand-line a bonefish of any size! The safest way is to gently let the loose line slip through your fingers. Be aware that if the fish eats the fly close to you, there can be a good bit of this loose line. Watch your line no matter how tempting it is to watch the fish run. Any bonefish angler can testify that having a loop of line wrap around the handle is about the worst way to lose a fish, and that can happen in a split second if you’re not watching that line clear. Holding a bonefish out of water for longer than 15 seconds makes it 600% more likely to die post-release. Hold the fly rod tip high while clearing the line. This helps keep the fish’s head up and keep it from immediately snagging you on coral or mangrove shoots. Whenever a fish is running away from you, keep that rod tip high, and I mean high. This also helps keep any slack from getting in the line, because the bent rod will straighten if the fish turns back at you, immediately taking up the slack. Only on very large fish should you lower the rod tip to apply pressure, and even then you want to keep a decent bend in the rod to protect your tippet. Don’t “lip” bonefish or hang with any lip-gripping device (e.g. BogaGrip). Keep upward pressure at the end of the fight. Guide Davin watches a guest at the most tricky part of the battle. Once the fish finishes with it’s long runs, you can reel it back in. The bigger the fish the more runs it will make, so you might reel it in only to have it blast off again. Don’t try to stop it; let it run against the drag. Once it’s tired and get’s close it will begin to circle with it’s head down. At this point keep pressure up and slightly back from the fish’s direction. The goal is to get it’s head out of the water. Once you’ve done that you can land it easily. Try grabbing a bonefish too soon and it will raise hell, kicking and splashing. This can result in broken rod tips, busted leaders and injured fish. But, once that head breaks the surface the fish is yours. If it’s your first bonefish or your biggest, now is the time to grab a quick picture. Gently cradle the fish in the water, holding it by the tail and just behind the mouth. Once you’re partner/guide is ready to snap the pic quickly lift the fish from the water and take the photo. If you need more than one, keep the fish in the water between shots! If it’s not your biggest or first, keep it wet—and simply slip out the barbless hook and watch them swim away. PLEASE READ ALL BONEFISH & TARPON TRUST’S BONEFISH HANDLING ADVICE. Rods: 7-9 Weight, Medium-to-Fast Action. Reels: Large Arbor, Anodized with smooth drag. Backing: Minimum 150 yds. 20-30 lb. Dacron or micro-braid. Lines: Weight-forward, Floating, Tropical. Sized to match rod. Leaders: Tapered, 12-16 lb. mono. 9-12 ft. (flouro is ok, but not preferred). Rent It Here, Don't Pack It. 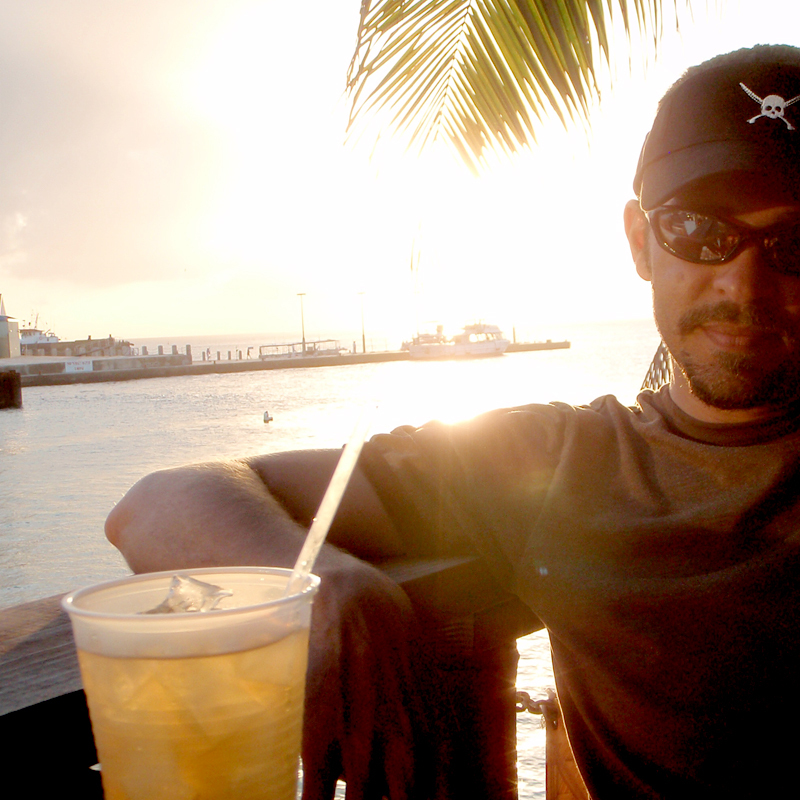 Davin Ebanks, a bonefish guide from Grand Cayman for over 15 years. He’s fished bones from Hawaii to Honduras. 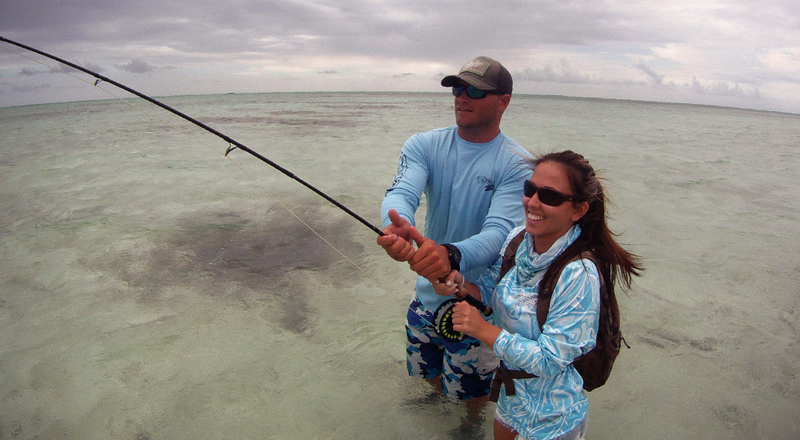 Grand Cayman fishing guide, Davin Ebanks, practicing his casting. Of course, none of the above matters if you can’t get your fly to the fish in the first place. The number one thing you can do to make your trip better is to practice your casting, and then practice some more. You’re paying good money for a guide to put you on fish and he’ll work hard all day to do so. You owe it to yourself to be able to get the fly to the fish when the time comes. Remember distance is not nearly as important as accuracy. A lot of anglers miss fish because they couldn’t get off a shot in time, not because they were too far away! Many bonefish (and other flats species) are hooked within 40 feet. False casting a half dozen times merely ensures a spooked fish. Fly Casting Tip: Double-Haul for the Wind from Davin Ebanks, Fly Fishing Guide on Vimeo.